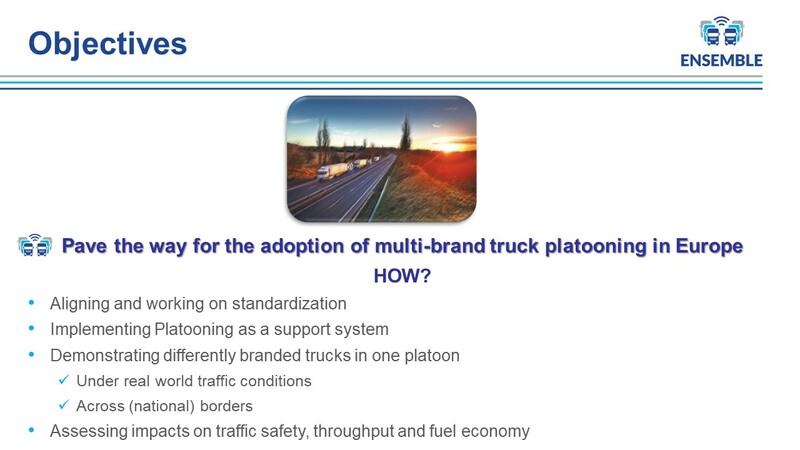 Interoperable platooning — when forming a scalable, multi-brand convoy – the vehicles must be compatible to ensure correct and safe operation. 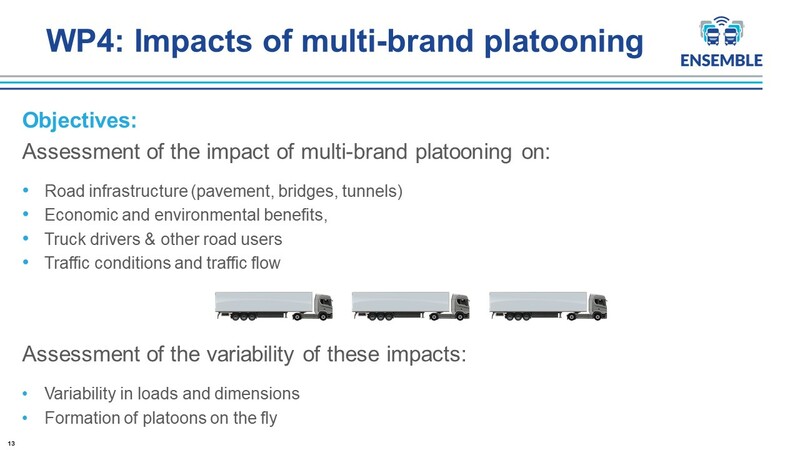 Platooning levels will be defined to break down the complexity of multi-brand platooning into manageable steps towards deployment on public roads whilst reflecting the full diversity of trucks. 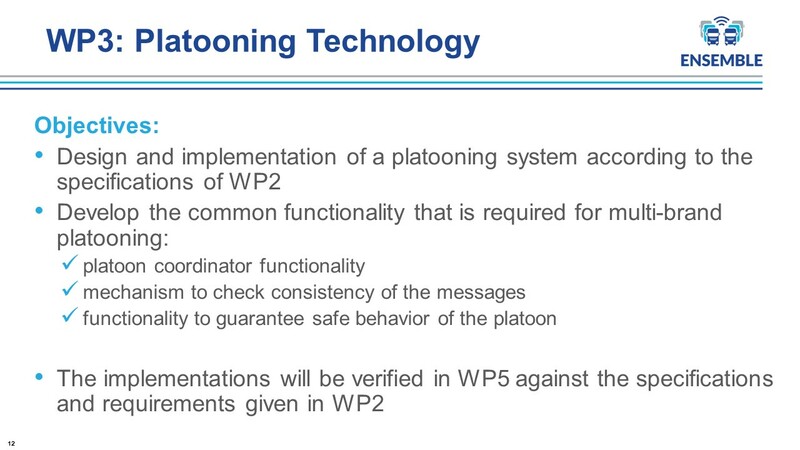 Safe Platooning — in ENSEMBLE designing fail-safe and fault tolerant mechanisms is a priority to include safe interaction both within the platoon and with other road users using secure wireless communication. 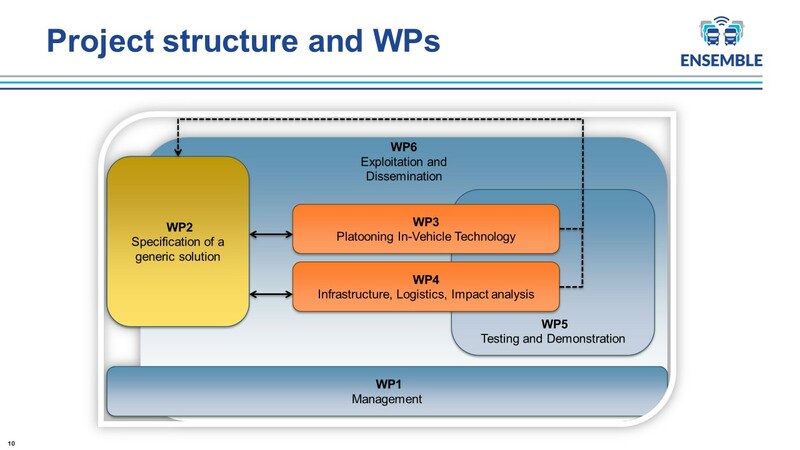 ENSEMBLE will approach the road authorities to jointly define road approval requirements taking into account the impact of platoons on the road and infrastructure. 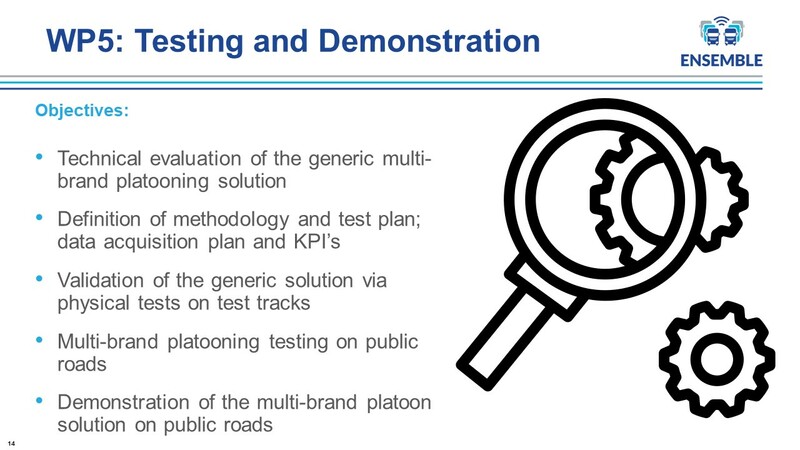 Real-life platooning — Practical tests on closed testing grounds and in real life serve to an experience of ‘learning by doing’, to assess the impact on traffic and infrastructure and to promote multi-brand platooning through a presentation of a multi-brand platoon in real traffic conditions across national borders. 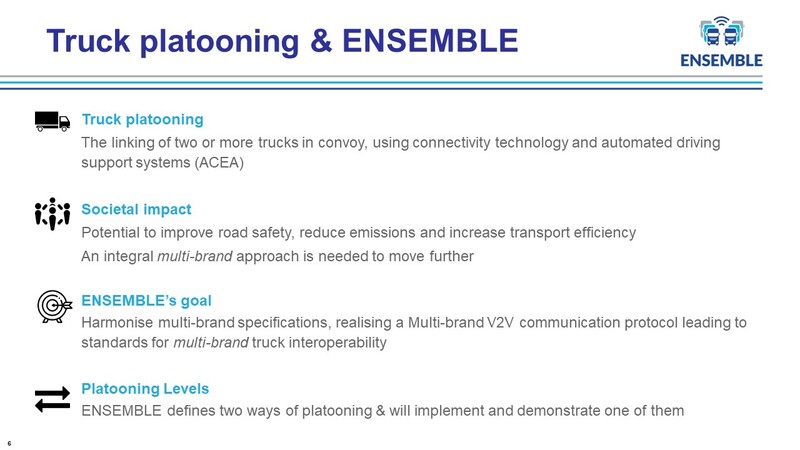 Embedded platooning — ENSEMBLE will design an interface to cloud-based services so that the platooning concept can be seamlessly integrated into the logistic value chain. 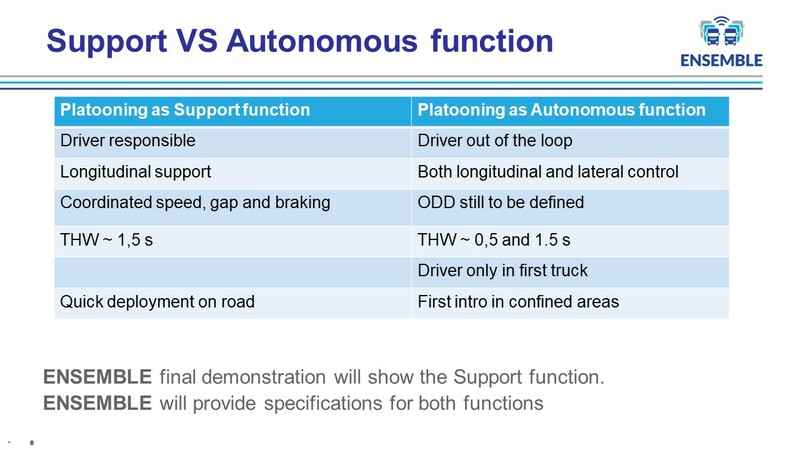 It is the explicit aim of this project to take the last steps of technological research before full deployment of multi-brand truck platooning. ENSEMBLE wants to communicate the economic, societal and environmental impact of decisions surrounding platoon forming and dissolving. 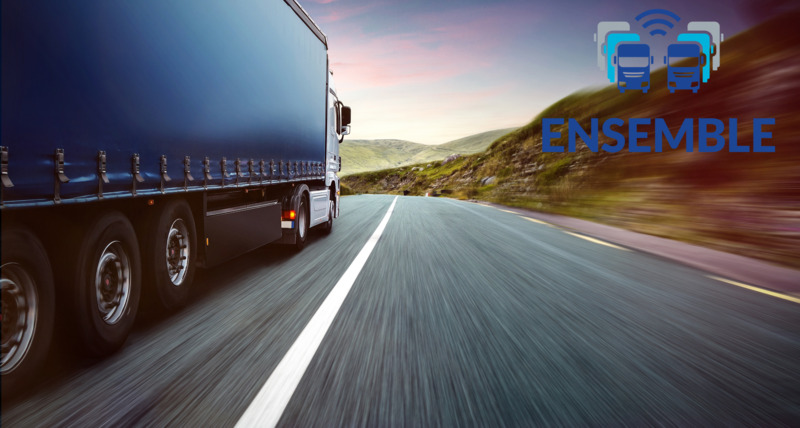 ENSEMBLE also strives to modernize the transport system by finding an optimal balance between fuel consumption, emission level, travel times and impact on highway traffic flow, resulting in reduced impacts on climate change, air pollution, noise, health and accidents. 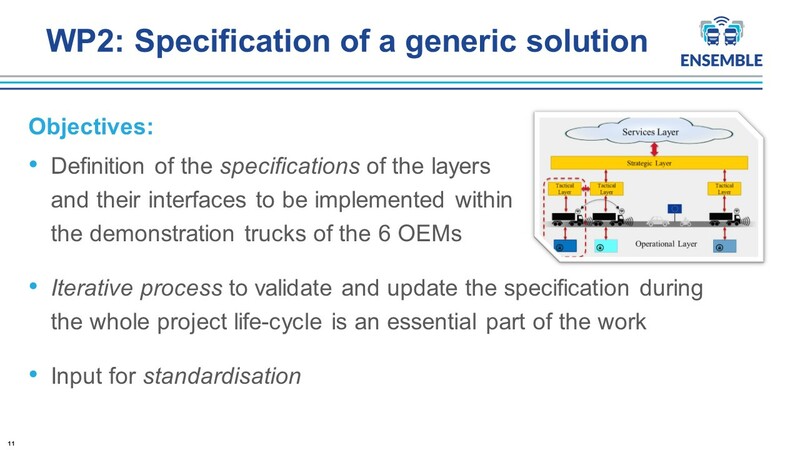 Below you find a list of ENSEMBLE public deliverables you can consult anytime. 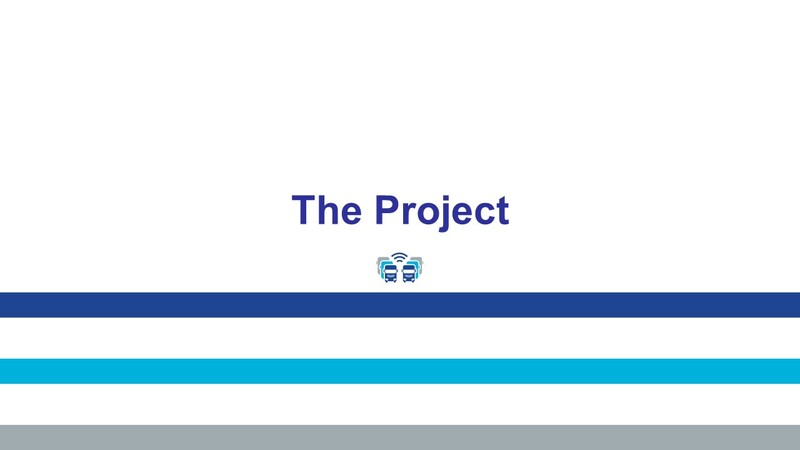 The public deliverables are regularly uploaded in the Library section of this website for download. 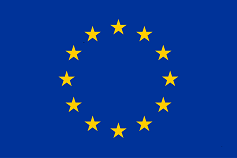 The deliverables currently available in the library have not been approved by the European Commission yet.